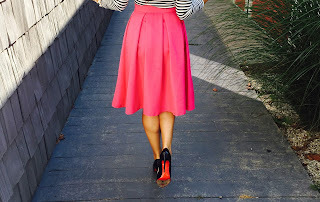 Pin Money: Mixology... three color combos to try now! I know I say this all of the time, but all of us have so many colorful clothing options in our closets that we are just not utilizing. Issach Mizarahi said it best, "Color is like food for the spirit - plus it's not addictive or fattening." I love this quote because it is so true! When you wear color you find yourself standing taller and being noticed. I'm not sure why, probably because we are all creatures of habit, but we pair the same items together that make up the same ole' outfits. Have fun with the clothes, jewelry, shoes, and bags that you have, and if you want something inexpensive, and fun try some of these options below. Do not be afraid of mixing different colors together! The brighter the mix, the more you will stand out and look amazing. Cheers to a week of colorful options! Red and Turquoise with a touch of tan looks rich and original. This outfit is perfect for weekends and for traveling. 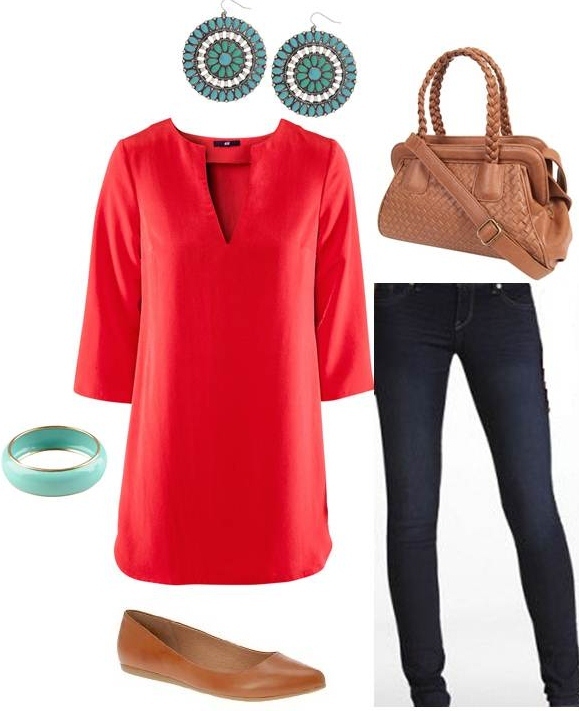 Find these extreme stretch stella jean leggings at Express for $79.80, Howett Aldo camel flats for $65.00, Red tunic at H&M for $29.95, Peralescent Teardrop Turquoise earrings from Forever 21 for $3.80, Lacquered bracelet from Forever 21 for $3.80, and Woven leatherette tan handbag from Forever 21 for $34.80. Orange you glad you tried this combo?! Orange and Navy is always classic, plus you can start wearing the combo now and into spring. Find this fabulous orange blazer at H&M for $49.95, Navy and white striped tank at H&M for $7.95, Old Navy boyfriend jeans for $34.94, Kelsi Pump at DSW for $44.94, Leaf drop earrings from Forever 21 for $4.80, and cut out paisley bracelet from Forever 21 for $7.80. Yellow and Gray is so soft, sweet, and unique all in one. Find this yellow side button top at Old Navy for $29.94, Gray H&M pants for $24.95, Charlotte Russe yellow suede pumps for $30.00, spiked gray hoops from Forever 21 for $4.80, and gray layered bracelet from Forever 21 for $5.80.